A little over three weeks out from Halloween, I thought it might be fun to write a quick post about vampire fiction. I’ve read Bram Stoker’s Dracula. It’s great, but I prefer Stephen King’s Salem’s Lot. Mr. Stoker literally wrote the rules on vampire fiction with Dracula, and Mr. King followed suit with some flourishes of his own. Since then we’ve seen many non-traditional takes on the fictional vampire. I am particularly fond of two. Octavia Butler’s Fledgling mixes strong and accessible prose with a unique angle on the vampire genre. Her vampires constitute a species apart from humans, not undead supernatural monsters. She tells the story from the perspective of a young (by vampire standards) girl who must recover her lost memories and learn what it means to be something other than human. In American Vampire writer Scott Synder and artist Rafael Albuquerque have taken the classic vampire mythos and added more than a dash of grit and grime. The stories of their characters play out over the history of America, moving deftly back and forward in time to key moments in their personal histories, and different eras in the history of the nation. Even if you don’t normally read graphic novels, give this series a try. The first volume even includes a story from Mr. King! There’s a lot of great vampire fiction out there, so I would love to hear about more of it—conventional or not! from the MGM Motion Picture "The Time Machine"
Recently, I posted a positive review of the new novel by Charles Yu, entitled How to Live Safely in a Science Fictional Universe. So I was delighted to come across an article by Yu written for The Guardian of Great Britain in which he names his top ten time travel books. As you can see, Mr. Yu has played it a little loose with his list, which he readily admits. Besides fiction, there is non-fiction, including an article on time travel by Kurt Godel, of Gödel, Escher, Bach fame. I don’t have a problem with that per se, but I do take issue with calling the list ten time travel books, when two are short stories in larger collections (not devoted to time travel stories) and one is a journal article. Still, it is a pleasure to see what he likes and, since they are his rules, he’s allowed to break them. Here’s an additional list of ten more time travel books, all novels this time, to supplement the list above. A couple of my favorite time travel books did not make Yu’s list, though his own book certainly makes mine. I am going to carry over one; though not on my list, Slaughter-House Five, which is one of my favorite books, period, it certainly deserves to be. 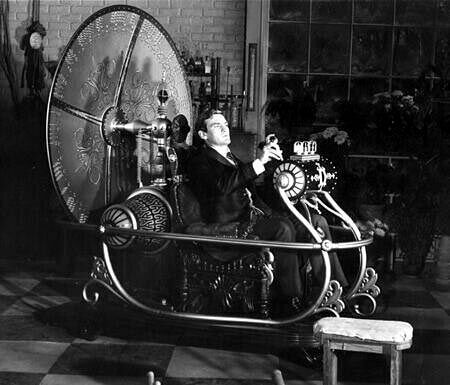 These 12 additional time travel novels hardly address how many are missing from the original list; in fact, this list is lopsided in its own way: a bit too literary from some folks, I’m thinking. So, what do you think? Anything missing? PS The only edition of Behold the Man any of the libraries has is the original abbreviated novella, which Michael Moorcock expanded into a full novel — we intend to correct that situation by ordering a copy ASAP.